Proceed directly to the collection. Adam Grant was one of the most respected figure painters in the Midwest, a self-taught master whose work was sought by museums, galleries, and private collectors, and admired by critics and curators. When Poland fell into Nazi hands during World War II, Adam’s world changed dramatically. It would be his art, his passion, that would get him through the harrowing experience of the Holocaust and the years to follow. At the age of 18, Adam was imprisoned in Auschwitz. There, not only did painting and drawing put bread in his mouth, but would ultimately be the reason for his survival. After being transferred to Mauthausen, his art allowed him to escape the stone quarry, where thousands of prisoners died each week. The camp was liberated in 1945, and Adam spent 5 years in a displaced persons camp in Germany before he was sponsored to emigrate to the U. S. in June 1950. He lived in Detroit designing floats for the Christmas parade as well as working on his own art projects. When the Palmer Paint Company wanted to make a hobby craft that used paints, Dan Robbins thought up paint-by-numbers. Paint by numbers allowed the hobbiest to complete their own masterpieces. In 1951, the sales were booming, and Dan Robbins advertised for additional artists. Adam was the first to answer, and Robbins instantly knew that he was the one for the job. Not only was his portfolio and talent extensive, but his work was outstanding and he was soon made lead artist at the company. Dan Robbins writes of Adam: “Of all the artists who ever picked up a brush to create an original paint by number subject, whether for Craft Master or any of its competitors, Adam was far and away the best. It was his creative talent that set the quality standard for the paint by number industry as a whole and for Craft Master in particular. They were lucky to have him. 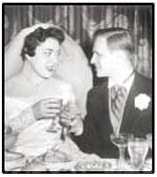 At his new position with Palmer Paint he met his future wife, Peggy, when she was also hired as an artist. He changed his name to Grant, and they married and moved with the company, then Craft Master, to Toledo, where she still lives today. 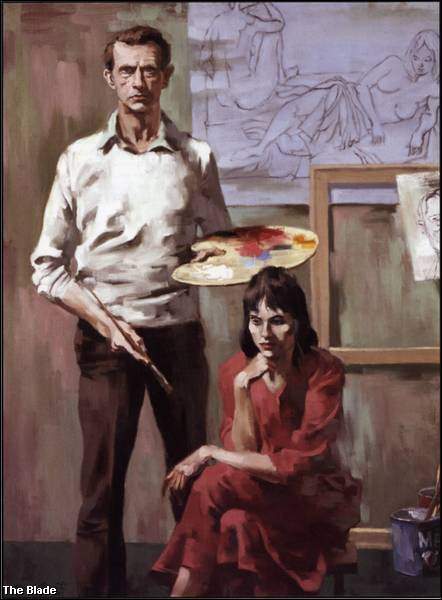 She encouraged him to paint in oils instead of using pen and ink as a medium. He soon began his work as a master of the human figure, and often used the female figure as a symbol for life and happiness. His art continued to be an outlet for his experiences in the hands of the Nazis. In June, 1992, Adam Grant died at age 67. Peggy Grant continues to promote her husband’s work both in the United States and in his native Poland. She journeyed into his past on a trip to both Mauthausen and Auschwitz in 1998. Four of Adam’s paintings are now part of the permanent collection at Auschwitz, symbols of his survival. Over the years Adam Grant has won much recognition for his works, and they are part of many permanent collections in the Midwest, including from The Butler Institute of American Art, The University of Toledo, Bowling Green State University and the Owens Illinois Corporate collection.